Many plastic bags are labeled #2 or #4, but they are too thin to recycle with hard plastics and will get caught in the processing machinery. Find out how to dispose of plastic bags. Only plastic bags that are clean and dry can be recycled. Empty your bag and wash out any sticky residues. Paper receipts, food traces or other materials can contaminate the recycling process. Bring along a reusable tote to save plastic on your next trip to the grocery store. 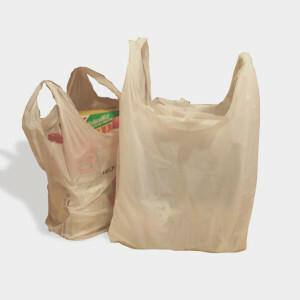 Some grocery stores will offer a small cash rebate when you bring in bags. More than one million plastic bags are used per minute worldwide, and on a daily basis, over 10 metric tons of plastic from Los Angeles enter into the Pacific Ocean each day. Ninety percent of trash floating in the ocean is from plastic that will take between five hundred and one thousand years to degrade. In the meantime, one million birds and 100,000 marine animals are killed each year because of plastic floating in the ocean. Check out this fun video from Vancouver, Washington about how plastic bags and films are recycled into products like composite lumber, which is often used to make decks.